This chapter looks at how we can use the sense of touch as a from of frequency modulation that expands our skills to survive and prosper in shifts. Times are changing so fast, it is hard to keep up. This applies to investing, business and all of life. What we can be sure of is that the future is increasingly unsure. This is not a negative statement for those who are prepared. Those who are flexible, who embrace change, who spot trends and act can really move ahead. The greatest impediment for success is normally the old boys network… the old officials… trying to hold new ideas and new energy in place. Never before have we possessed so many tools to bypass this inertia that would otherwise stifle our creative endeavors. The foundation of success in the outer world is improvements within… clearer thinking… more stable emotions… broader perspectives… wiser activity… healthier habits… expanded horizons and fortified bravery. To succeed as change accelerates… we need to hone all our senses. This report looks at how we can use Frequency Modulation through touch to, live, work and invest better by getting into the zone. Previous chapters showed how light and sound can make us smarter. We can also gain improvement in our discriminative abilities through touch. When my first daughter was born, my grandmother who was a quarter Native American taught me a trick passed down from her mother to massage my daughter’s head every day while she was as a baby. “This will make her head smooth and make her smarter” my grandmother told me. I made this a habit with all five of our children. A wife’s tale? Maybe but it has been proven that one can derive many benefits through head massage. Seventy percent (70%) of the human nervous system is in the head. A head massage activates neural pathways to the brain, stimulating unused brain cells, and awakening cellular intelligence. This awakened cellular intelligence reorganizes the nervous system, enlivening nerves reminding the cells of their function, and creating cell to cell communication. A massage can stimulate and balance the beta, alpha, theta, and delta brain wave patterns in all the brain hemispheres and create an the optimum brain wave state (the zone). This state is creative, healing, and peaceful. Successful people utilize this brain wave pattern naturally and more often. This tactile frequency balancing goes beyond the head… especially to the feet. Years ago while in Ecuador, I ate a bad melon in Quito and became ill. That night, between the nausea and high altitude, I passed out. No big deal except the place I chose, a marble clad bathroom lined with lots of sharp hard corners. To this day I do not know how I managed to break my nose, crack the back of my skull, create a concussion and wrench my neck. I’ve read about near death experiences and mine fits the description, but, as skeptics, let’s just attribute the next moments to a flood of endorphins, laying in a pool of blood on an icy cold marble floor. I was somewhere else, a place so sweet I cannot even begin to describe. Next thing I remember was Merri, (darn her, I thought) trying to bring me back. She managed to get me awake and into bed and that night and the next two days were a stream of fuzzy thoughts, Shamans and Doctors visiting and not being able to move my head for the pain. The yatchak came every day and stayed most of the night. He rubbed and rubbed the bottom of my feet. ” This will reconnect your earth energy,” he would say. I believe scientists would say he was stimulating neurons in my brain. Our family has a tradition of rubbing hands and feet. Merri and I do this for each other every night and when our children were small the children joined in as well. To this day when the family gets together we all enjoy a great nightly foot rubbing. History shows that our forefathers figured out the importance of balancing in the tactile frequency range long ago. 5000 BC the Chinese practiced pressure therapy and foot massage. Egyptian, inscriptions from 2300 BC found in Ankhmahor’s tomb at Saqqara show foot and hand massage. The Bible is filled with reference to washing and anointing the head and feet. Indian and Tibetan mystics documented the existence of the Luminous Energy field thousands of years ago describing it as an aura or a halo around the physical body that was generated and received by meridians that run along the surface of the skin. In China they are called acupuncture points. In Indian that are called charkas. In the Andes. Rio de Luz (Rivers of Light). These energy meridians are analogous to the circulatory system inside the body. They are described as the arteries and veins of the body’s energy field. These meridians are frequency generators and receivers… just like a radio. They tune into frequency signals… however these are very different ones than your FM radio receives. Stimulating them sends messages to the brain associated body parts. This reduces tension, improves circulation and helps the body deliver oxygen and nutrients to the cells. All this makes us smarter but there is more. One key to health, wealth and happiness is a strong, clear mind and effective memory. Yet as we age, mental capacity seems to diminish. In fact most of us suffer some mental shutdown in situations that make us nervous, unsure, or downright afraid. Our loss of mental capacity in times of stress can even become a self-fulfilling prophesy. We worry, and this reduces our ability to deal with our concern. Hence the problem grows. This mental shut-down is caused in part by a ancient mechanism at the top of the neck that is an important defense mechanism in our body. This point responds to our thoughts and reactions toward everything we experience. This is a mechanism meant to take over when escape becomes impossible. The occiput, atlas and axis jam together scrambling the circuitry of the hindbrain and shutting down half the blood flow to the brain. This creates a possum effect… a last stance appealing to the nature in all living things that avoids the dead. Our lives of daily stress cause mini activations of this switch-off mechanism. The mechanism shuts off the blood flow to the brain so it feels no pain. This is good when you have severe physical trauma, but not for day to day stress. The brain needs a full blood supply to do its job. Stress makes us less capable which then creates more stress. Massage… the human touch however, relaxes and enhances the blood supply. A number of scientists at the Department of Neurology, University of Muenster, Muenster, Germany performed different studies. If you care to wade through the scientific language, links to the abstract of their research paper entitled “Learning of tactile frequency discrimination in humans” are below. In short what the studies said was: Learning is based on the remodeling of neural connections in the brain. The purpose of the present study was to examine the extent to which training-induced improvements in tactile frequency discrimination in humans are correlated with an increase of cortical representations in the primary somatosensory cortex. During the first 15 days of training, there was a steep improvement in frequency discrimination, which generalized from the trained finger to its homologue on the opposite hand, and to a lesser extent, to the other fingers on both hands. Retention of improved performance in frequency discrimination 30 days after training was demonstrated for all digits. Another study by researchers from Laboratory for Human Brain Dynamics in Japan the Department of Psychology at McMaster University, Hamilton, Ontario Canada entitled: “MEG study of early cortical plasticity following multiple digit frequency discrimination training in humans” says: Recent advances in human brain imaging techniques have made it possible to study cortical plasticity during learning using human subjects. Three recent MEG studies have reported plasticity changes after somatosensory stimulation.The first MEG study  used the protocol of Wanget al. and showed that extensive training produced areversible decrease in the strength of equivalentcurrent dipoles after perceptual learning, although fusion was predicted. The second MEG study showed that passive tactile finger co-activation for 40 min reduced the Euclidean distance between median and ulnar nerve somatosensory evoked filed. The third MEG study  reported that sequences oftactile stimulation affect the organization of theprimary somatosensory cortex after a brief training series. In this work, we used MEG to study early plasticity following multiple digit frequency discrimination training. MEG by the way is MagnetoEncephaloGraphy a procedure that analyzes the magnetic responses of neurons. In other words, the researchers are documenting what the ancients have known for millenniums… that the correct types of tactile frequencies help the brain work better. There are many ways to use tactile stimulation to increase intelligence. Merri and I have a weekly massage by a trained massage therapist. We massage one another’s hands and feet most evenings and in the morning self massage our face, head, ears, hands and feet with essential oils. If you use oils or lotions for massage make sure they are pure essential oils or of a therapeutic quality. Many oils and lotions with synthetic ingredients can be harmful rather than helpful. We obtain our essential oils oils from our long time friend, Candace Newman. See more about her oils here. We believe, have been treated with Phytobiodermie and use their products for over two decades. Phytobiodermie is a unique holistic method for beauty, based on the energetic principles of traditional Chinese medicine and the 5 Element theory. Phytobiodermie has created a full line of skincare pure products for Face, Scalp, Body, and Bath. It received the Prize for Innovation at the Paris Beauty Show in April 1998. Pytobiodermie products are formulated for the needs of each set of conditions according to the 5 Elements. They are color-coded and named accordingly. 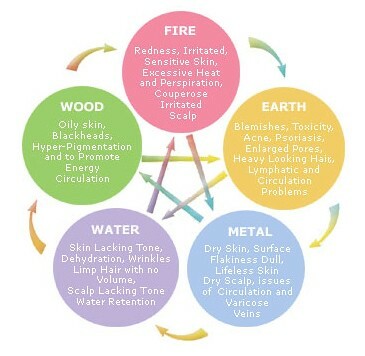 To learn about the 5 Elements Body product line, select the category you are interested in. Phytobiodermie is uniquely based on the “energetic principles” because Traditional Chinese medicine offers the most comprehensive explanation of vital energy. Each Element represents an aspect of vital energy and their manifestation on the skin and body shape. Energetic harmony is required for the body to be “in balance” and healthy. We feel that this type of treatment is an excellent resource for us for radiation, toxicity and just plain stress. Learn more about Phytobiodermie here. Times are changing so fast, it seems hard to keep up. Yet we have seven powerful tools… our five senses and the brain, which when balanced helps them tap into greater intelligence from our intuition and the heart. We have looked at some quantum realities and the importance of using light, smell and touch to increase our flexibility and potential. Future chapters in this report will consider our sense of taste and hearing as well. To make it easier to learn about frequency modulation, we have recorded our “Frequency Modulation Workshop”. You can download the audio recording of this workshop for $99. Save $99 I’ll email you right away the audio recording of $99 Frequency Modulation Workshop FREE when you enroll in any of the three courses or tours below. May 9-10, 2011 Ecuador Shamanic Minga Tour. Details here. May – September or November 2011 Super Thinking Plus Spanish. June 24-25-26 in West Jefferson, North Carolina. Enroll here. We hope to see you at an upcoming course.